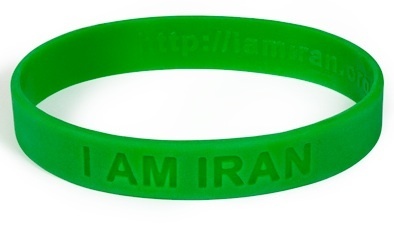 We provide green "I AM IRAN" wristbands to people FREE OF CHARGE. Please donate and help us. Please wear one on your wrist. Why Wristbands? To not forget about what happened in Iran after the June 12th 2009 presidential elections. Why free? To reach as many people as possible. What's the trick? No tricks... You just have to promise that you wear the wristbands and show your support. Why online donations? We need to make more of these and distribute them around the world. Where does the money go? Right now all the donations go towards making more wristbands as well as shipping them to the donors. Some small amount are being used to pay for domains and hosting services for other online projects like Lotfan (http://lotfan.org). In any case, all the accounts are online you can look at the spreadsheets or follow the donations online on twitter. NEW: From now on, your donations will be (hopefully) updated automatically on swivel. However this feature is still in Beta. I don't go to rallies / I couldn't find wristbands at rallies in my city? You can donate and we will send you Three for every 10 dollars donated. Unfortunately due to expensive postal fees, we cannot ship anything for less! Wait... didn't you say it's free? Yes but the shipping costs are high, so unfortunately we cannot afford to send everyone a free wristband by mail. Where can I donate? Here on this website. Click on the Donate button. What happened in Iran that you guys care so much about? Visit Lotfan.org for more information on what really happend in Iran.